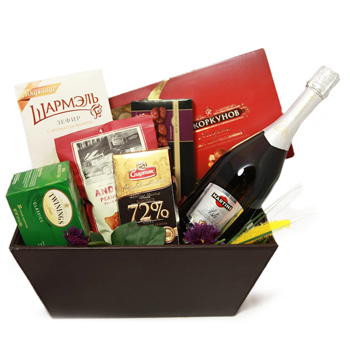 Special occasions and holidays can be full of hustling and busy preparations, so make sure the person doing all the planning gets a little pampering as well with a bottle of Martini Asti Sparkling Wine (750 ml), Korkunov Milk Chocolates, a Dark Chocolate Bar, Chocolate Covered Raisins, and more. Thank them for their hard word, add some extra treats to the family gathering, or remind them how much you care when you send Relax and Indulge. Note: you can add gift options below. Flower and Gift Basket Delivery to Russia & CIS .